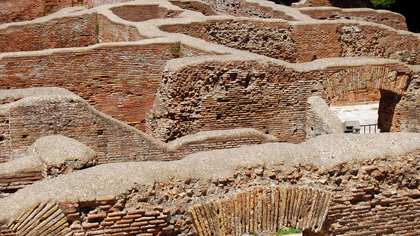 The Port of Ancient Rome (Ostia Antica) is truly a place where you can touch, climb and play! Conveniently situated 40 minutes from central Rome it makes for a fascinating and relaxing half day out of the city. Multiple tour discount: Book this private tour with any other private tour and get €20 off this Private Tour! Discounts applied upon checkout. 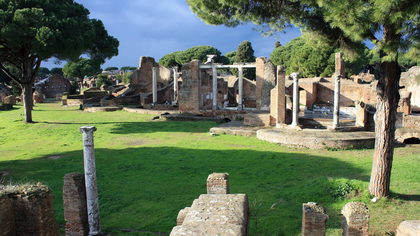 From the ticket office, the private walking tour of Ostia Antica proceeds along the necropolis of the city to the Decumanus Maximus (main street) which is lined with the remains of shops, food stalls and warehouses which help create a vibrant idea of ancient times. Our English speaking tour through the Ancient Port of Rome takes in the Baths of Neptune, boasting excellent views of the surrounding town. The main Theater of Ostia with its tiers and curved seating helps us to experience an auditorium from ancient times fit for Pavarotti. The nearby Forum of the Corporations preserves floor mosaics of the various guilds once active in the city. 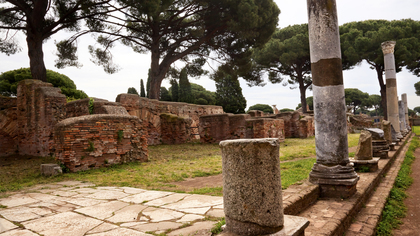 Entering an ancient tenement, climbing to the third level in order to have command of the ruins, you will see that Ostia Antica is truly a place where you can touch, climb and play! Visit a thermopoliym or 'pub', with its marble counter tops and wall paintings showing the food on offer, it is hard to believe that this well preserved tavern is over 1,900 years old! 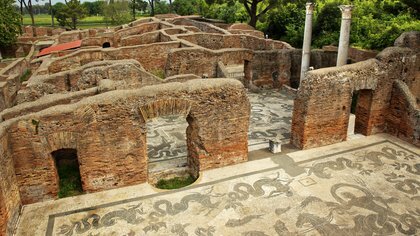 Our Ostia Antica private tour guide reveals public spaces, bakeries, places of worship, private villas, bath houses (plus latrines -- but not for current use!) Ostia Antica is in some ways better preserved than Pompeii and definitely much quieter. Even in the height of the Italian summer, Ostia Antica offers welcome shade under the many beautiful umbrella pine trees. On the coast of the Mediterranean, the many leafy areas give a sense of pleasant parkland. A well situated in & outdoor cafe / restaurant in statuesque surroundings (literally), makes for a perfect place to reflect on what has been seen. But if you prefer you can bring your own lunch as the relaxed setting is perfect for a picnic. 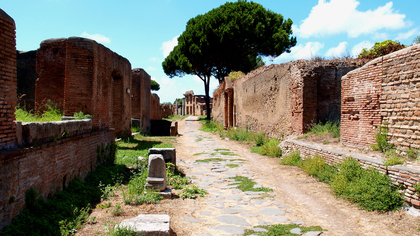 This journey through the Ancient Port of Rome is a walking tour you will never forget! *Please note: Entrance fees are separate from the cost of the tour and payable on the day of the visit. Meeting Time : 10:00am; if you wish to begin at a different hour please specify in the 'special requests' section. Meeting Point : 'Stazione Porta San Paolo' (Porta San Paolo Train Station) Directly outside of the train staion. This station is also linked with "Piramide" Metro / Subway Station. Full details and map will be included in a confirmation email. Arriving by Train : Our tour guide will meet you in Rome at the Metro / Subway stop 'PIRAMIDE' and bring you to Ostia Antica by train. *If you would like to have a private driver for the return trip to and from your hotel please contact us for pricing. Dress Code : Comfortable walking shoes!